Father Alan Horton began serving as Interim of St. Gregory’s on Tuesday, March 1 and became Rector Friday, June 17. Father Horton was born October of 1981 and raised in Arlington, Texas. He grew up attending St. Alban’s where he and his family were very active. In junior high, Father Horton became active in the D/FW renewal movement through New Beginnings and Happening; participating and serving on staff for multiple weekends and eventually serving as rector of Happening #109. It was through his involvement with the youth group at St. Alban’s as well as serving on the renewal weekends that drew Father Horton to his calling to ministry. Following high school, he attended the University of Texas at Arlington for two years before transferring to Texas A&M where he earned a Bachelor of Arts Degree in speech communication. That following year, Father Horton married his high school sweetheart, Holly Smith, and moved to Beeville, Texas where she was finishing up her degree in dental hygiene. While in Beeville, Father Horton and Holly attended St. Philip’s Episcopal Church and were involved with getting their youth group organized. During his time there, Father Horton was employed by the Texas Department of Criminal Justice as a correctional officer at a maximum security prison. After returning to the Fort Worth area, Father Horton took a position as the Youth and Young Families minister at St. Stephen’s in Hurst where he served for three years. In his final year there, he went into the discernment process with the diocese and in the fall of 2008 packed up the family and moved to Nashotah, Wisconsin to begin seminary. During his final semester, Father Horton was ordained to the diaconate at St. Vincent’s Cathedral on March 19, 2011. After seminary, Father Horton and his family returned to Arlington where he was assigned as a curate at St. Peter and St. Paul and ordained to the priesthood on September 17, 2011. 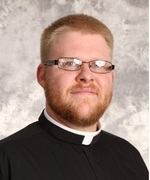 Father Horton joined the staff of St. Vincent’s as Assistant Priest in July of 2013. Doris Short has been the Bookkeeper/Treasurer for St. Gregory since 2009. She retired from Cummins Southern Plains as payroll manager after working at Cummins for 43 years. Doris received a B.A. in Business from DBU. Doris has two married sons and 4 grandchildren. Connie Barker has been St. Gregory's secretary since 2004. She is married to James and has three children and two grandchildren.